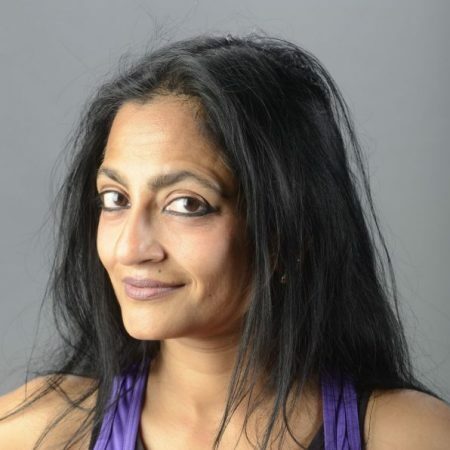 Her recent work, Shyamali, was described as “brimming with memorable moments and activist passion” (Star Tribune, 9/17/17) and her choreography has been applauded for “never flinch(ing) from exposing injustices women around the globe are subjected to daily” (Star Tribune, 9/19/16). She has toured her work to Ethiopia with State Department support, presenting the keynote performance at the Crossing Boundaries Festival in Addis Ababa (2015); to the Bethlehem International Performing Arts Festival, Palestine (2018); the Aavejak Avaaz and Pragjyoti International Dance Festivals, India (2018), the Harare International Dance Festival, Zimbabwe (2013), the New Waves Institute of Dance and Performance, Trinidad (2012), and other national and international locations. Ananya is Professor of Dance at the University of Minnesota, where she teaches courses in Dance Studies and technique. She presented the keynote talk at the joint conference of Congress of Research in Dance and Society of Dance History Scholars (2016). She is currently writing her second book, under contract with Palgrave McMillan, exploring the politics of “contemporary dance” from the perspective of artists from global communities of color.